Credit card fraud is becoming the crime of choice for offenders in Chicago who are not particularly inclined to violence. If undetected, the crime can be staggeringly lucrative and often does not carry the stigma of outright theft, sexual depravity, or violence. It is tempting to cast credit card fraudsters as low-level miscreants who do not deserve the worst approbation of society. However this is not a victimless crime, as residents of Minooka will testify. The South West side of Chicago seems to have developed a particularly affinity for this specific economic crime. Although the law enforcement agencies have already sent out the alarm to the local population; they are not clear about what exactly causes this locality to have a higher than usual propensity for the crime. The fraud will take a number of forms which are increasing in their complexity and scope. For example some people engage in identity fraud and impersonation. Unsuspecting victims will only realize that they have been caught in the web when they are sent a bill for goods and services that they never purchased. The fraudster will have used the victim’s identity in order to make a fraudulent application for a credit line and will proceed onto an expansive spending spree. At other times the perpetrator is far more subtle; getting the details of the card and using it to make online purchases. 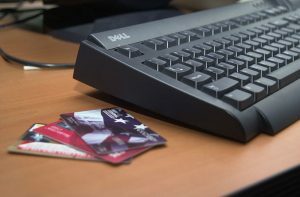 When the card is physically stolen, most victims will make a police report, but hardly anything ever comes out of that process because of the difficulty of tracing the culprits and the relatively low individual amounts that are involved in each incident of credit card fraud. The behavior and rules of the credit card issuers has come under fire from some legal experts for encouraging the fraud. This is because the companies tend to take on liability for losses once a problem has been shared with them. The use of credit card protection also means that often the victim is protected from the consequences of the crime and have no further inclination to get involved in a tedious court process. Of course, when the overall costs of credit card crimes are taken into consideration, this is a very serious problem that requires a systematic response. The typical offender is rarely threatening, so the court cases do not received as much publicity as would have been the case in a large-scale operation. Banks normally go through a brief investigative process before issuing a replacement card, but in the worst case scenarios the innocent applicant could end up being blacklisted for something that he or she had no control over. The chip and pin system was mean to reduce the incidences of credit card fraud in areas such as Chicago but so far the impact has not been as significant as the lawmakers might have wanted. Other factors may serve to undermine the process of apprehending offenders. For example, some members of the public believe that it could be an inside job. Hence the vendor will have an internalized credit card skimming process that can read the details that will later be used for defrauding the victim. Others feel that the vendors are somewhat negligent when it comes to ensuring authenticity and identity for credit card users. Chicago has typically prosecuted credit card fraud under the theft law. However there are signs of increasing sophistication in this type of offending. Perhaps it is time to review the current arrangements with a view to develop a much more coordinated and effective response to the vice that is credit card fraud. If you are facing a credit card fraud charge, you need a lawyer who will give you the best chance at winning your case. Call David Freidberg, Attorney at Law today at 312-560-7100 for your free consultation.